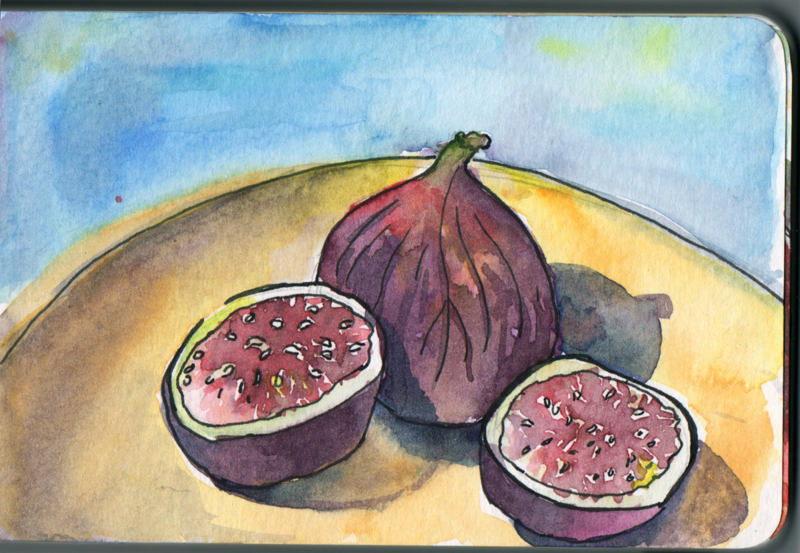 A few weeks ago, I was inspired by Gwenaelle Glotin’s video of watercolour paintings in a tiny Moleskine sketchbook. I immediately bough a pocket Moleskine to start a similar project of my own. 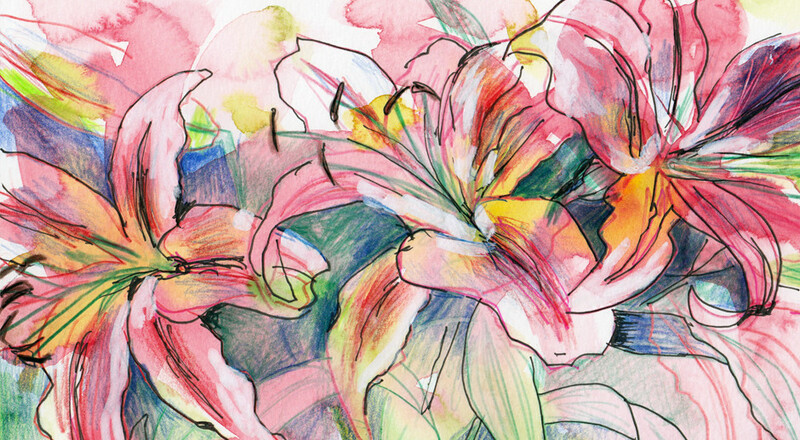 I was excited to fill it with sketches in pen and watercolour. 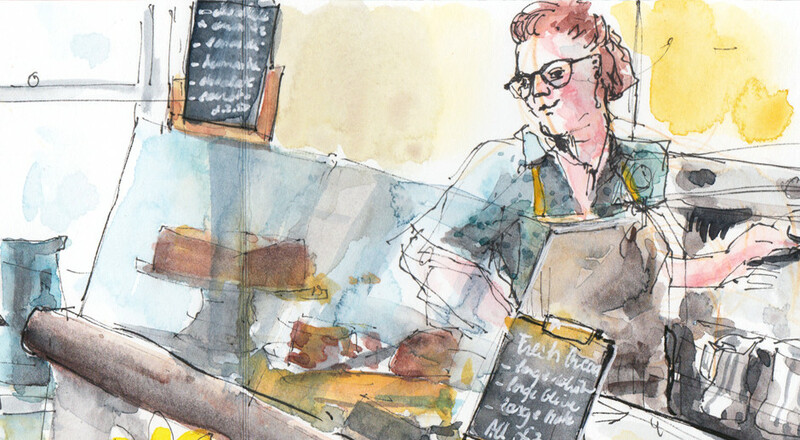 I have used the large Moleskine watercolour sketchbooks before and I really like them. Like its big brother, this small one has good slightly textured watercolour paper. It opens flat, so you can draw across a double page spread and has nice rounded corners. 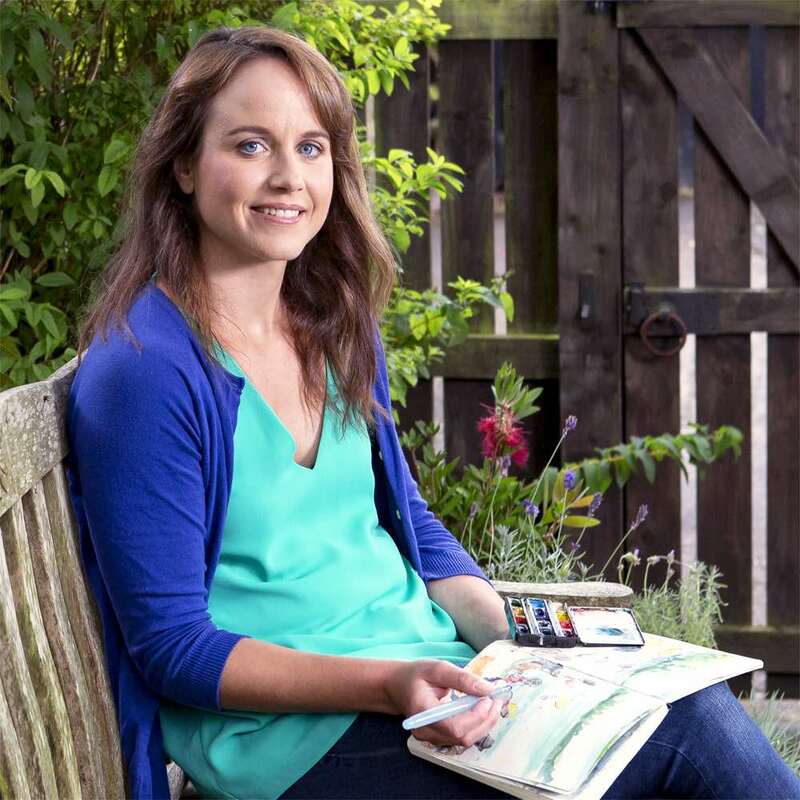 This Moleskine watercolour sketchbook is tiny – only about the length of a pen! The book is tiny – about the length of a pen. 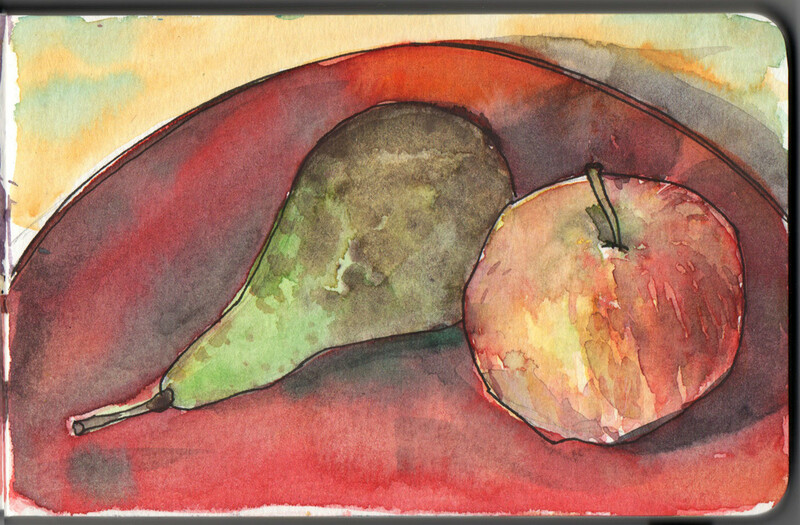 When I first got it, I was unsure about what to draw in it and started to draw a couple of still life studies of fruit. It is interesting to take the time to study shapes and shadows in detail but I find the end results slightly bland. Maybe it is the artificial set up. Maybe I spent too much time on those as there was no sense of urgency. After all you don’t need to draw quick if your subject isn’t going to move. 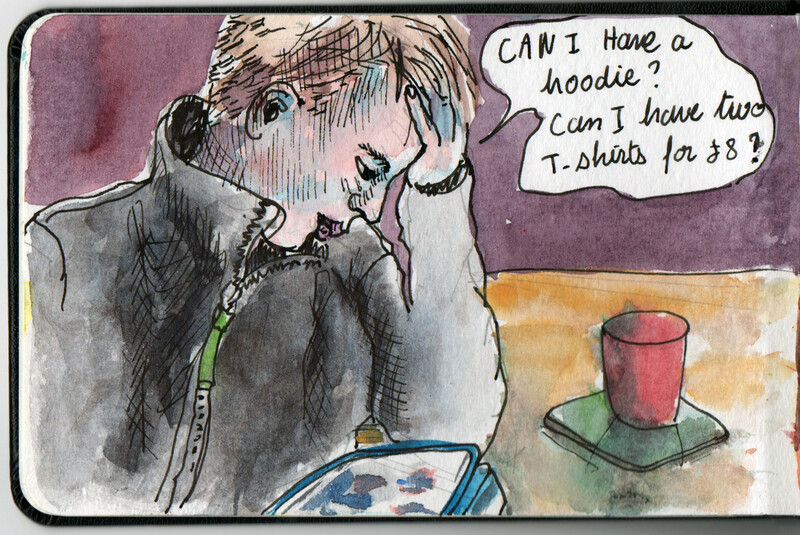 I found that simple everyday scenes could be drawn quickly in a small format. I drew rough shapes in pencil first to make sure my drawing did fit in the page – the smaller size takes a bit of getting used to. 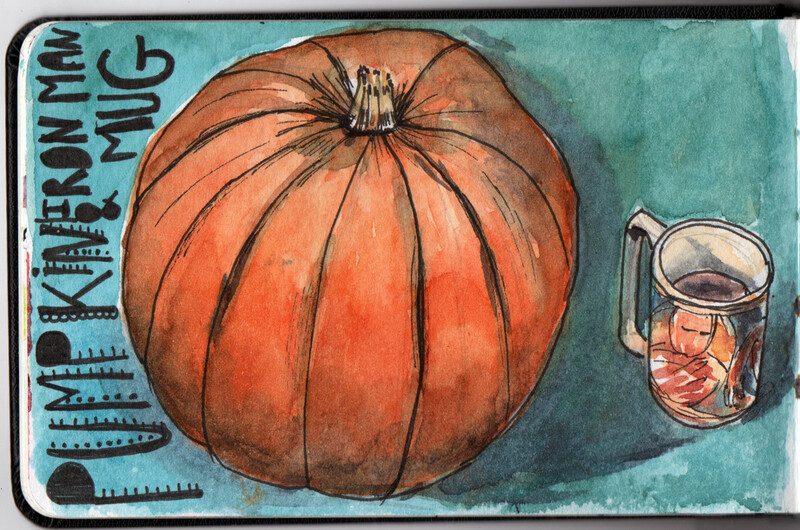 I had draw our Halloween pumpkin before we carved it. Drew my mug too as it was there. Think the text livens up the page. I like the contrast of the orange and blue. 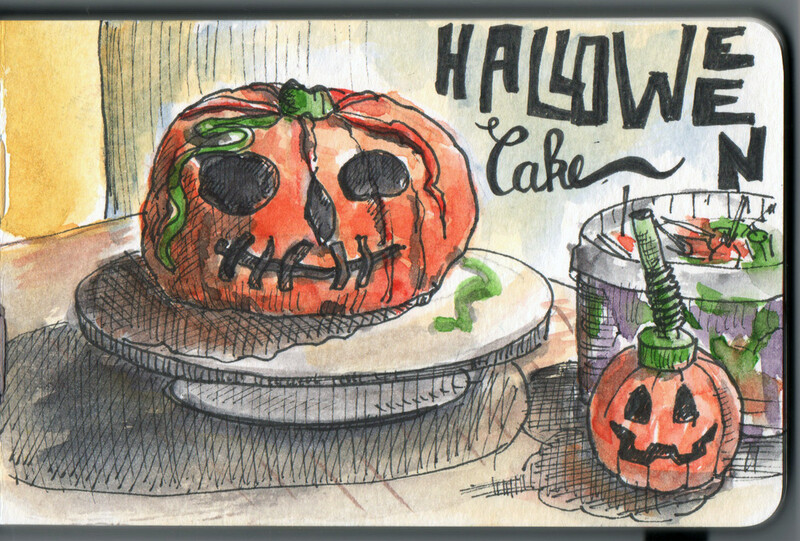 Quickly drew this while George was rolling out icing for a pumpkin shaped Halloween cake. Got caught out by the small size of the sketchbook and had to draw him smaller than Katie so his head would fit in the page! I have a giant 5 year old, but I like the end result as it captures a moment in time. That’s it so far. 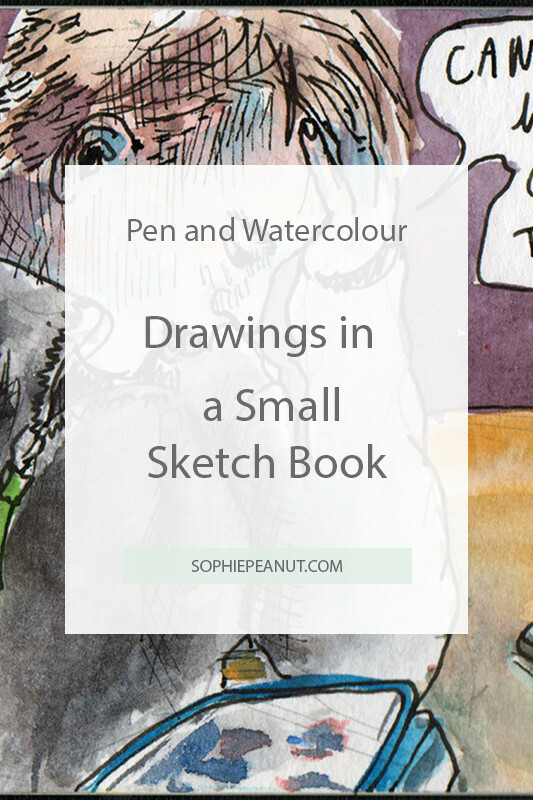 I think it will be good for quick drawings of small simple scenes in pen and watercolour. I was so inspired with meeting Valerie Wartelle and her wonderful felting at Art in Action that I followed her web site as soon as I got home and found you! Brilliant! Love your style, love the “simplicity” of your materials and methods – I do carry a similar set of materials with me BUT rarely actually use them. Thanks Yvonne, Valerie not only makes beautiful artwork – she is a really nice lady too! I am glad you like my drawings. 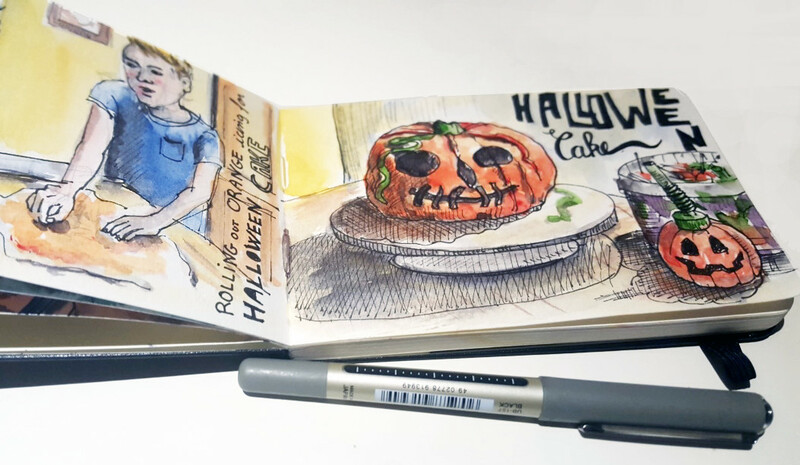 To get started, you could try to get your sketchbook out when you are waiting and have a few minutes to kill (much more fun than checking your phone). 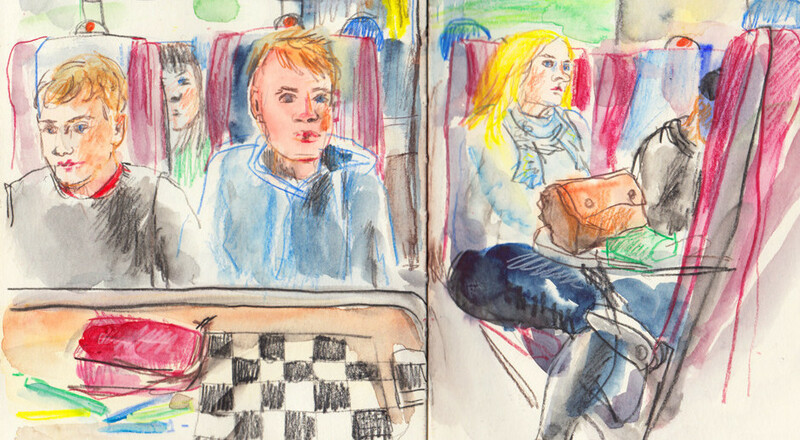 Cafes and trains are good to sketch people too. 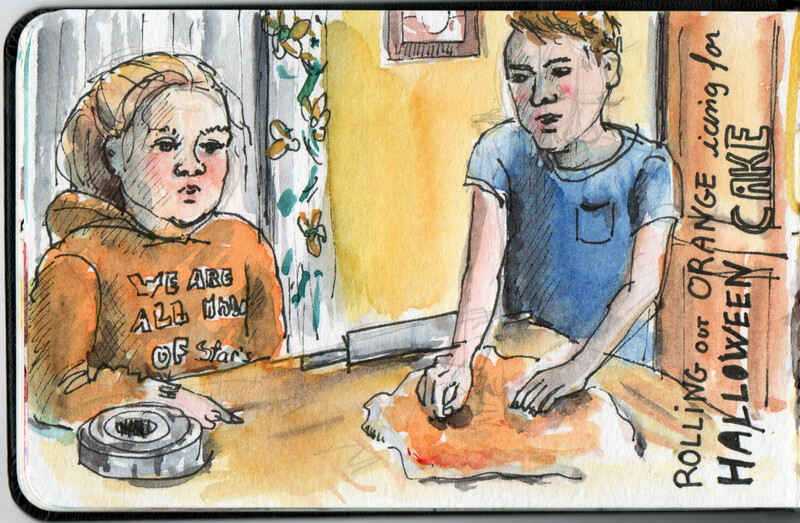 Quick 5 minutes sketches of small objects around the house can be good to get a habit started too. Let us know how you get on!